Leave your car on the small verge parking area ½ mile south west of Kilham (Grid ref: NT 881320). Continue along the road for 150 metres then turn left through a metal gate bearing a `Permissive Footpath` arrow. Follow path downhill, cross a small bridge and head right on a path to a metal gate. Once through, bear right to a marker post and then left uphill to reach a small stile on the left. Now turn half –right and follow the marker posts upwards passing thorough some hawthorn bushes scattered across the hillside. Now aim for the marker post near to a saddle in the mid-distance. When reached do not turn left with marker posts but continue straight on to reach the saddle between Kilham Hill and an unnamed hill. Once on the saddle turn right through a metal gate and follow the path, soon to become a quad track, uphill bearing right along the way to cross the unnamed top. 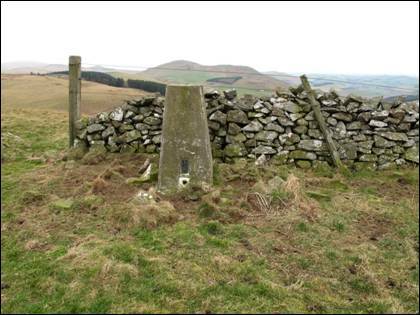 Continue with the quad track downhill and then head straight uphill to reach triangulation pillar-topped Longknowe Hill.